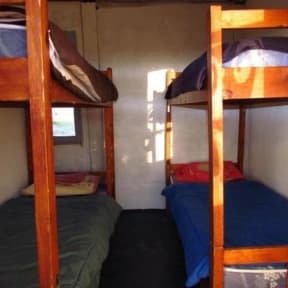 The following group types are not accepted by this hostel: Junior / Primary School, High / Secondary School, College / University, Stag/Hen/Bachelor Party If you have misrepresented the type of group you are booking for, your booking may be cancelled by the hostel." Located on the beach of the skull, so named because the Indians who once inhabited these lands herding cattle up here, where he fished, selling the hides to European ships and throwing the remains into the sea. Over the years the golden sands of Cape blanqueaban covered with bones of cow skulls. 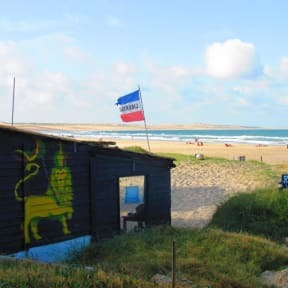 On this beach superb views of the dunes, islands and the Atlantic Ocean, is mounted Cabo Polonio Hostel, just 100 meters from the center and fishing boats. Auberge tres agréable!!! A 20 mètres de la plage, très tranquille en octobre-novembre, personnelle très sympas et très discret! Je recommande cet auberge!! !